Goldfaden's musical comedy Die Kaprizne Kalemoyd (alternatively titled Kabtszohn et Hungerman) was first published in 1887 in Warsaw by Baumritter & Gonsher. The image that appears above is of a later edition, published in Warsaw in 1905 by Y. Lidski. Several editions of Die Kaprizne Kalemoyd were released in New York, one in 1893 by Y. Sapirshṭeyn Publishers, and another in 1897 by the Hebrew Publishing Company. Die Kaprizne Kalemoyd follows the story of Khane, a fickle young woman, who is waiting for a perfect mate to sweep her off her feet. Kabtsnzohn, with the help of his partner in crime Hungerman, learns of Khane’s preferences and molds himself to her ideal husband in order to get at her father's fortune. 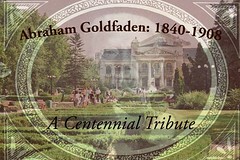 Goldfaden premiered Die Kaprizne Kalemoyd in Romania in 1877. Source: Yiddish Drama Collection at the Jewish National and University Library.